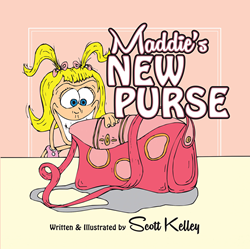 Scott Kelley’s newly released “Maddie’s New Purse” is a hilarious children’s story about a little girl who latches onto a favorite new purse to feel all grown up. “Maddie’s New Purse” from Christian Faith Publishing author Scott Kelley is a delightful rhyming children’s picture book with tickling illustrations that tell the story of the author’s daughter, Maddie, who nags her daddy for a little pink purse, the perfect thing in her eyes to transform her into a grownup. She dreads parting with it for even a moment and takes it everywhere with her—until something else catches her eye during a shopping trip with Mommy. “Maddie’s New Purse”: a funny story in rhyme of a little girl’s favorite new possession. “Maddie’s New Purse” is the creation of published author Scott Kelley, a married father of four; a child at heart who enjoys writing and illustrating stories for children and pulling the humor from every situation. for milk and some bread. at the purse Maddie found. she now dragged on the ground. ‘Are you sure that you want it?’ I asked, already knowing. ‘Oh yes, Daddy, please.’ Her rosy cheeks glowing. It’s not like she broke me at $2.99. than just three dollar bills. Published by Christian Faith Publishing, Scott Kelley’s new book is a fun, heartwarming story of a little girl’s love for dressing up, and a father’s love for his little girl. Kelley artfully highlights small moments to cherish that almost any parent can relate to. View a synopsis of “Maddie’s New Purse” on YouTube. Consumers can purchase“Maddie’s New Purse” at traditional brick & mortar bookstores, or online at Amazon.com, Apple iTunes store, or Barnes and Noble. For additional information or inquiries about “Maddie’s New Purse”, contact the Christian Faith Publishing media department at 866-554-0919.